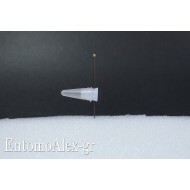 These vials are provided with a soft but durable silicone cap they allow you to place genitalia of your specimen under the cardboard simply by adding alcohol or glycerin inside the vial, close with the cap and pinning as it was a further tag. This way, you will never have the need to unstick or remove the edeagus from inclusion in order to study it later. Very useful also for micro soft-body insects that can not be glued and need to stay under liquid so you always have the specimens in your entomological box with all the data and not in tubes scattered in some box. 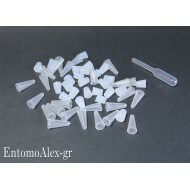 pinning MICRO VIALS x genitalia 16mm 0.1ml There is 1 product.